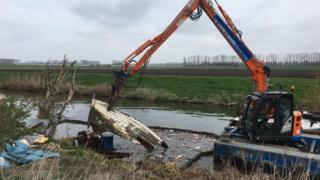 The wreckage of one the "little ships" that took part in the evacuation of troops from Dunkirk during World War Two has been removed from a river. The Compass Rose was one of about 850 boats that sailed to Dunkirk in France between 26 May and 4 June 1940 as part of Operation Dynamo. The 12m (40ft) wooden cruiser had been abandoned and sank in the River Lark, near Isleham in Cambridgeshire. The Environment Agency said it was a "sad ending" for the vessel. Details of the Compass Rose's role in the evacuation of more than 336,000 British and French soldiers who were trapped on the beaches at Dunkirk appears to have been lost, the agency said. A previous owner passed on a dossier when he sold it some time ago, but the new owner cannot be traced. The Compass Rose was abandoned and left to sink, obstructing navigation on the waterway. After several years in the water the wreck was too badly damaged to be salvaged and fell to pieces as it was being removed. "This is a sad ending for one of [the] boats that supported a heroic, life-saving effort during the war," said the Environment Agency's Paul Separovic. "It's regrettable the Compass Rose survived that momentous event only to be left to sink nearly 80 years later." The Dunkirk boat was one of 12 vessels removed by the agency from rivers as part of a "boat blitz". "We know the value these boats can carry - not just financially, but sentimentally and, in this case, historically - and that's why we're encouraging boaters to make sure their vessels are registered with the Environment Agency," Mr Separovic added.